MDC national vice-chairperson Tendai Biti, who is on trial for allegedly violating the Electoral Act after he announced that his party leader Nelson Chamisa had won the July 30 presidential election, yesterday insisted that the youthful opposition politician had, indeed, won in nine provinces, whose poll tallies were posted at polling stations manned by their party agents. Biti, who was put to his defence after his application for discharge was dismissed, told magistrate Gloria Takundwa that under normal circumstances, Chamisa would have been declared presidential election winner because, at the time, only Mashonaland West province had outstanding results. He said he did not announce the results, but simply interpreted what the Zimbabwe Electoral Commission had officially posted outside its polling stations. “In a normal election run by a normal elections commission, Advocate Nelson Chamisa would be the President right now. In my statement to the media, I said Chamisa won the elections in Manicaland, Harare, Matabeleland, Masvingo and Bulawayo and Zec did not dispute that in court, except in Mashonaland West province, where the results were not posted outside the polling station,” Biti told court. He said the police cherry-picked part of his statement to the media, leaving out other contents in order to incriminate him. When asked by prosecutor Tafadzwanashe Mpariwa why he announced the results before Zec’s official announcement, Biti told court that Zec had already announced the official results by posting them outside polling stations. Mpariwa was taken to task by Biti’s lawyer Beatrice Mtetwa after he asked the opposition legislator to compare the results he released to the Press and Zec’s official results. Mtetwa asked the prosecutor to tell the court the Zec presidential elections official results before Biti could give his own set of results. Mpariwa failed to, but insisted that Zec’s figures were the official ones. “Your Worship, I don’t think there is anyone who knows the official figures of the presidential election. Even Mr (Emmerson) Mnangagwa does not know the number of the votes he got,” Biti told court. He said he announced the results collected from their agents in nine provinces to put pressure on Zec to release the results, saying delaying the announcement would have given Zec room to manipulate the figures. Biti added that President Emmerson Mnangagwa’s July 31, 2018 tweet saying he had won the elections before Zec’s announcement was still on his handle and that Zanu PF secretary for legal affairs Munyaradzi Paul Mangwana said the same thing, but they were not arrested. Biti said his prosecution was politically motivated. 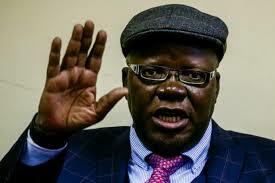 Takundwa postponed the matter to February 18 for ruling, but dismissed Biti’s application for discharge , saying the State had proved a prima facie case against him.